“The arrival of these pier caps marks the first in a series of return trips between Spain and Montreal. For this, we have chartered our own ship, which is a premiere for SSL. It is a bold, unique initiative that lets us manage all of the logistics that come with loading in Spain and shipping to the final destination, here in Canada,” says Alex Demers, Logistics Director for the New Champlain Bridge Corridor Project. Once in Montreal, a sophisticated logistic chain of events is set in motion to bring the parts from the port to the various work platforms. 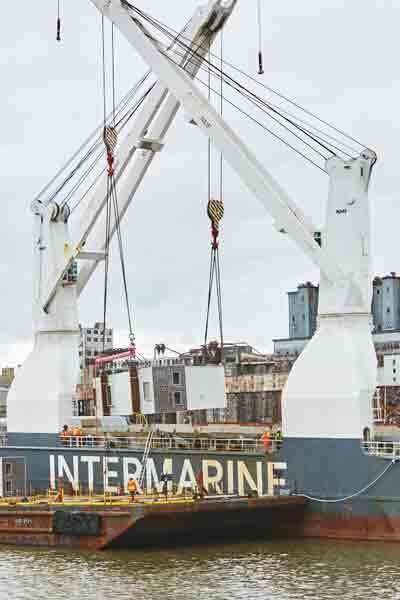 Notably, a winch barge transportation system has been devised by our maritime team to navigate upstream through the Île Notre-Dame rapids to the Victoria Bridge and make it easier to deliver the pieces to the work site. When mapping out the route, we had to factor in, among other things, the strength of the current and the shallow depth of the river. 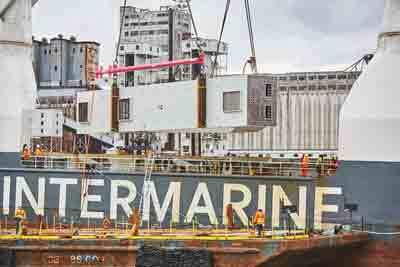 These maritime transportation and transhipment operations will be carried out a number of times over the coming months, until all 37 pier caps have been delivered, with 3 or 4 arriving monthly. Installation of the 37 pier caps will take from spring 2017 to spring 2018. 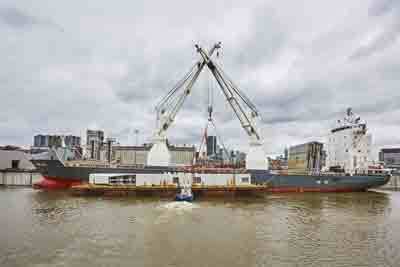 They will support the bridge’s superstructure.